Stone cantilever staircase in entrance hall of a new build. 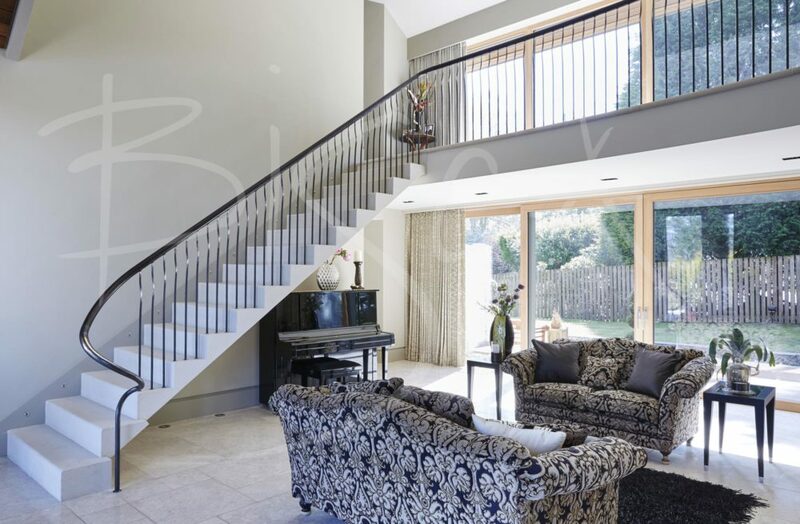 Our clients asked us to design a stone cantilever staircase and matching landing balustrade for the entrance hall of a new build property on the outskirts of Glasgow. 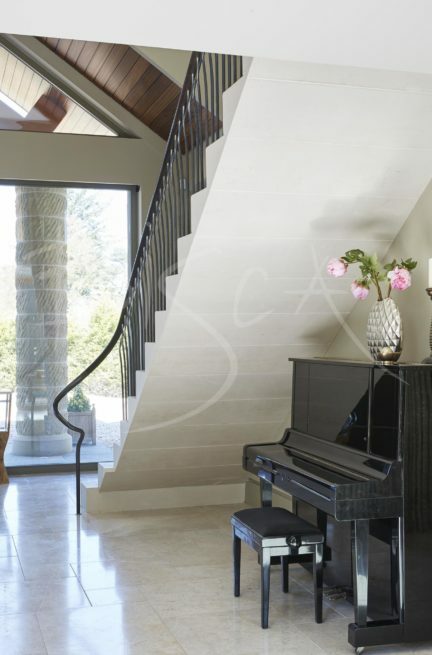 They liked Limestone treads and the combination of natural stone with hand forged uprights and leather handrail. The brief was timeless, contemporary and, above all, comfortable to ascend and descend. Bisca’s design featured blocks of limestone extending from the wall, neatly interlocked and rising up to the first floor gallery. The lower two treads extend slightly away from the wall. This small but important design detail creates a wider, and also a more dramatic, start to the staircase. On the underside of the stair the limestone treads form a smooth sweep of stone, reflecting natural daylight back into the room. A hand forged and textured stainless steel newel sits at the foot of the stair. The steel of the newel is spliced into the leather handrail. The profiled handrail then travels up and around the landing edges. The handrail is supported by individually hand-forged uprights with a subtle form at the top. 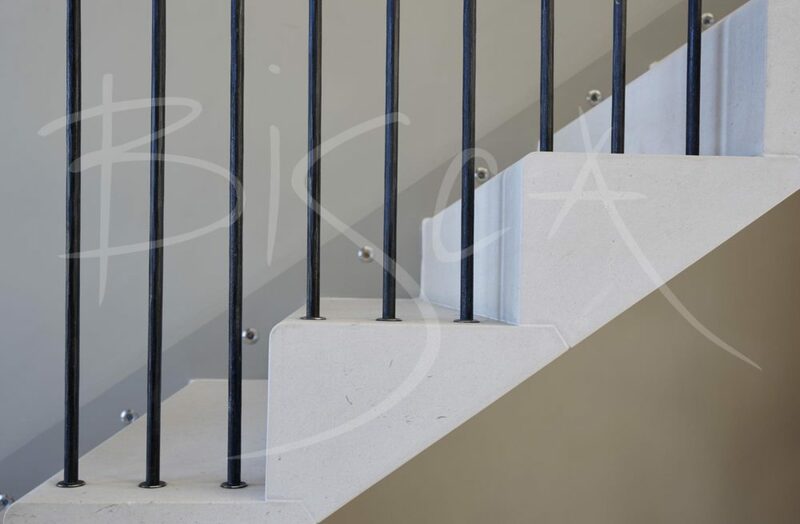 This adds detail to the balustrade and also increases the usable width of the stair. All connections into the stone are neatly finished with small steel bezels. A curved extension to the gallery balances the stair in its entrance space. 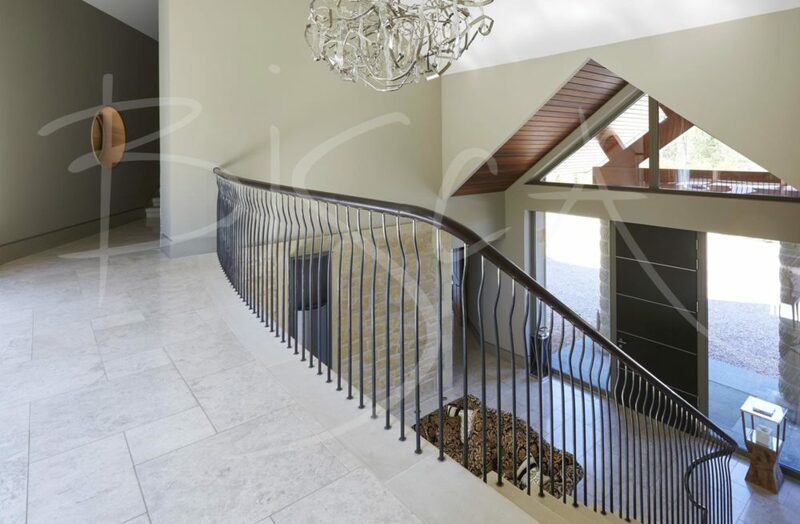 Bisca finished the gallery edges with a matching stone nosing to visually link with the staircase. Please quote reference 4342 for further information on this staircase.